This is an electronic download of the SPOT 5.6 Basic software for customers who have an older version of the SPOT software and would like to upgrade to the latest version. 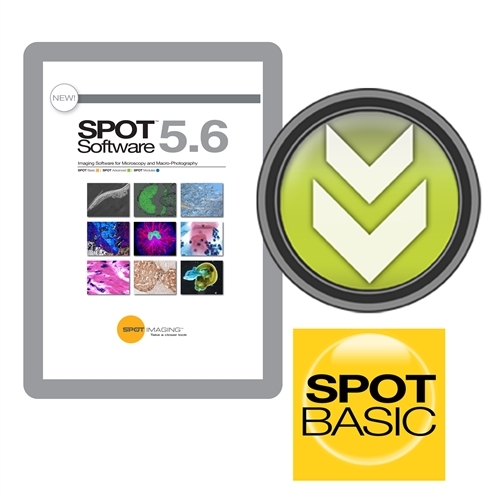 Customers who purchase this electronic download will receive an email with their new SPOT Software License ID, activation codes, and links to download the SPOT 5.6 Basic software once their order is processed. The SPOT Basic image capture software enables microscopists to create publication quality pictures easily. The live image window provides a preview of the image capture so you can see how the image will look before you capture it. The live image window is ideal for panning through slides to locate areas of interest, and its focus gauge and detail magnifier enable fast and precise focusing. Color temperature, contrast and automatic white balance options create excellent color fidelity. Acquiring flawless images or image sequences is as effortless as a single mouse click. After image capture, measurements, reticles, calibration marks, and other enhancements can be applied. Images can be dropped into a SPOT report for printing, or saved in several different file formats for publication or printing. The SPOT Basic software together with a SPOT digital camera provides a simple but effective way to enhance your professional image. For computer operating system compatibility, visit our website. In the space below, please enter the email address of the person who should receive the software. Once your order is processed, the email recipient will receive their software license and activation code. Please allow 3-5 business days for processing your order. Supports all SPOT camera models except PCI and PCIe card connected cameras.